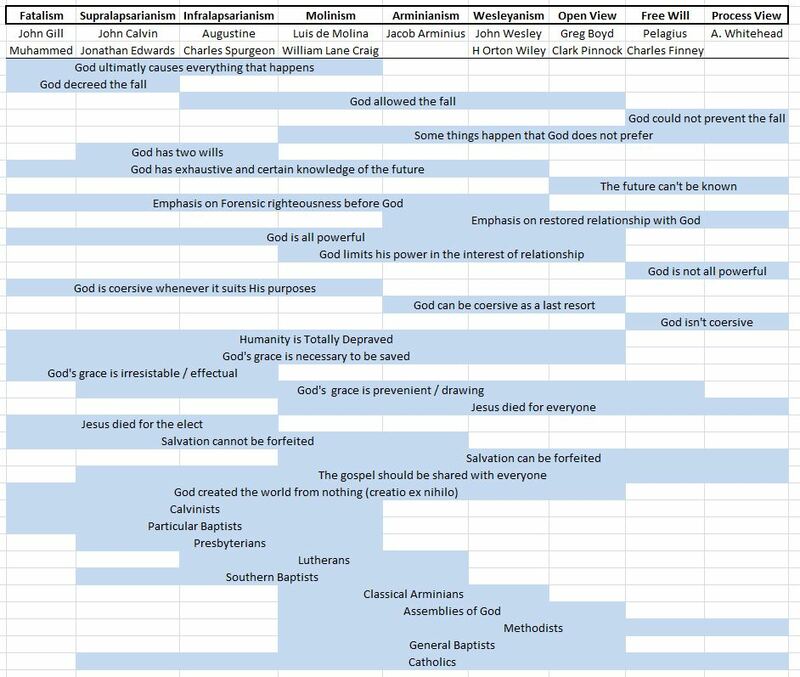 Anyone have a good chart on the spectrum of theological positions? The one below is the best I've found so far. I'm looking for a good overview chart to use as a starting point and a high level overview of the most important topics/distinctions between the various views. The one below is the best I've found so far. Interesting. Where did this come from? I don't know about the other theological traditions, but the chart does not accurately reflect the Roman Catholic teachings. This chart is more accurate for Roman Catholicism - http://www.religionfacts.com/denominations-beliefs. I do not know about its overall accuracy for other traditions. Thanks for the link Steve. If you were to ignore the bottom part of the chart that lists the denominations, would you say the top part listing the distinctions between the theological views is an accurate representation? Interesting chart. Thanks for sharing. would you say the top part listing the distinctions between the theological views is an accurate representation? Have you looked in House's Charts of Christian Theology & Doctrine? I haven't heard of his charts before. This may be what I'm looking for. Are these charts available in Logos? I did a quick search and didn't find it. Thanks for the link ... didn't know these were available. There is a place for well-researched, well-thought-out, carefully-edited-and-reviewed, summary charts. Like MJ, I have used the charts, below, for years ... but one must always remember that these sort of charts are only a beginning point and can never fully [or accurately?] represent the matter at hand. I am deeply involve in theological study and found the chart provided by Michael to be very benefical. Thank a lot. Welcome to the forums. Unfortunately, this is not a forum to advertise security software. Please read the forums guidelines. Thanks. Do you have this in logos because this is not the same chart or charts as the Kregall collection? These charts are not the same as the kregall charts. Do you know if these charts are available in logos? I didn't see any charts on church history, the chronology of the New Testament or the complete theology charts by House.